My first weekend of demos is now under my belt, and what a great start. A huge thanks to everyone who joined me at Chopwell and Gisburn, braving the cold and wet weather to try out some bikes. Gisburn was my first proper public demo day where I was based in the car park for people to turn up and have a go. It was an early start, I set off from Sheffield at 6, and even had to wait for a supermarket en route to open so I could buy doughnuts! It rained solidly driving over the Pennines, and I began to doubt whether anyone would actually turn up. By 9am I was all set up in the car park, and the first demo rider was already out on the trails! The rain wasn't as bad as the drive over but was showing no signs of relenting. 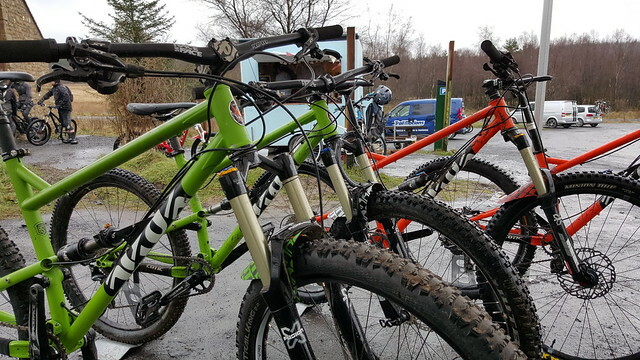 My fears of a quiet day were soon put to rest, the morning was a busy one with lots of keen riders getting stuck in on the Rockets and the hardtails, braving the rain and enjoying Gisburn's trails. The figure of 8 layout is perfect for testing a bike out, as the 'lower loop' has a great variety of trails in a short distance, and the Hope Line is part way round for those who like to get airborne. One guy even did the full 8 in 1 hour 25 mins on a Soul, that's very impressive. The best thing about the day was that everyone who tried a Rocket came pedalling back to the car park with a huge grin on their face. It's such a fun bike to ride, and everyone found it just wanted to go faster at every opportunity. Seeing people ride towards the stand dripping wet, mud spattered and grinning from ear to ear on a Rocket made my day. Worth standing in the rain for! Big shout to the guys who run the tea caravan at Gisburn for keeping me warm and caffeinated all day too. The clouds parted eventually, and I managed to get a ride in with my dad at the end of the day, who immediately decided he wants a Rocket too. I'll certainly head back to Gisburn later in the year with the demo fleet, hopefully on a better day. All being well I should be at Grizedale on 7th May and Stainburn on 8th May once the permits have been confirmed. So there's plenty of chances to try a Cotic in the North, hopefully I'll see you soon. Next up Cy will be at Steel City DH on 16th April with bikes to look at whilst enjoying the race. Sam's out with the trail group at Penmachno on 22nd April, but you'd be welcome to join them if you're in the area. Sunday 24th is a full demo at Nant yr Arian. Email to let us know what you'd like to ride and when. 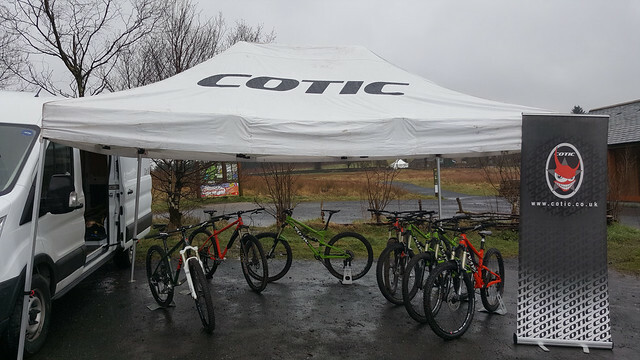 Weekend of 30th April the Cotic Rocket Bus will be down in Bristol, Leigh Woods, then Monday at Haldon near Exeter. Again, get in touch if you're in the area get in touch and book on.